Because words have meaning; that is, direct reference to objects and actions outside their own existence as spoken or written symbols – and because literature uses words as its artistic medium, a unique situation exists which greatly complicates critical activity. A poet of the Sung dynasty in ancient China (969-129 AD) expressed the idea perfectly and the accompanying portrait of Fukurokuju, God of Wisdom and Longevity, by Sesshu (ca. 1420) is meant to illustrate the point. 1 | Quoted by [Robert] Lawrence Binyon in The Flight of the Dragon, The Wisdom of the East Series (London; Murray, 1911), p. 84. The proposition is fairly simple; there is a relationship between our experience of the world around us and an artistic representation of it. The representation preserves something of the form of things as they are, but somehow transcends their natural and random existence in the physical world. Art re-forms experience in order to provide an analysis of it and/or a comment upon it. A musician, for example, selects sounds and arranges them into a pattern which creates new relationships among the constituent elements and awakens in the listener a new awareness to the possibilities of sound patterning. Music, however, does not normally refer to anything outside itself although it is possible through stylized imitation for music to suggest emotions, states of mind, and even physical phenomena such as a thunder storm or the flight of a bumble bee. Literature, on the other hand, cannot avoid referring to experience outside the work of art (objects, actions, or abstract ideas) because the words which constitute its artistic medium are bound to retain the conventional meaning of normal usage. Literature presents us with thoughts which go far beyond the structural inter-relationship of parts within the work. It offers a whole universe of ideas which have a direct relationship to our actual experience of life. A poem which celebrates ethnic identity, a play which examines present-day political realities, or a novel which exposes the moral corruption of contemporary life may invoke in us a direct and personal response because of an antecedent preoccupation with the subject. Yet the Sung poet is perfectly right in emphasizing the fact that literature is valued in so far as it exhibits the characteristics of art. The aesthetic qualities of a work of art are at least as important in literary criticism as the validity of the author’s vision or perception of human experience. It is, after all, the literary quality of the work, its mode and form of expression which captures the reader’s imagination and engages an audience beyond any prior preoccupation with the subject. The nature of literary criticism and role of the critic is largely dependent on an acceptable definition of literature itself. One view which has been fairly widely held is that literature is the expression of intense and personal experience in a unique and original form which collectively reflects the values and aspirations of a given people in a particular time and place. An individual work externalizes and eternalizes the writer’s perceptions of both self and the world outside. The critic’s role is to interpret works of literature for the public at large; not merely to describe or explain them, but rather to comment on and evaluate the quality of both the author’s literary composition and vision of, or insight into, human experience. In quest of excellence and truth the critic should function objectively, rather than popularizing or judging socio-politically. The real question is one of taste – the reader’s apprehension and/or appreciation of style and structure. A reading public is not always quick to recognize aesthetic innovation. Its sensibility, however refined, is often retarded and becomes outraged when faced with something new and unexpected – innovations in either form or style. It is the function of criticism to challenge received ideas, to create an environment of understanding and appreciation with respect to aesthetics and to make current the criteria by which the particular idiom of a writer can be measured. The critic should be a knowledgeable and sensitive judge of literary expression, a mediator rather than an arbiter of taste. ; but more importantly should see, and help the public to see, the relationship between the subtleties of literary expression and the urgent concerns of the community which are being represented through a complex structure of words. In approaching literature one must accept that it is a primary act of the author’s imagination which transmutes the form of things as they are into art, into a stylized image of reality which gives us thoughts beyond the domain of art. 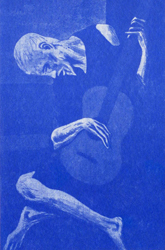 The following excerpts from Wallace Steven’s ‘The Man with the Blue Guitar’ were inspired by Pablo Picasso’s painting, ‘The Old Guitarist’ (1903) which is accessible here. A tune beyond us, yet ourselves. 2 | The Collected Poems of Wallace Stevens (New York; Knopf, 1966), pp. 165 & 167-168. But, if a primary act of imagination transmutes experience into artifact, it follows that a corresponding act of imagination is required of the reader who perceives in that image the full resonance of its ideas and the intricacies of its craftsmanship, as well as its relevance to the real world in which we live and have our being. The critic is important to society, not so much as an interpreter of technique and style, nor as an interpreter of its subtleties and suggested meaning, but rather concerned with the relationship between imagination and experience. Critics are preoccupied with contentions between aesthetic composition and perennial problems of the human condition such as social justice, morality, psychology and spirituality; but is more actively involved in analyzing and articulating the process itself – the interaction between image and experience which produces a meaningful statement. In examining and evaluating a literary work critics explore the multiple possibilities of significance. A complex structure or scheme is created in which every element functions and interacts with every other. That scheme may not be immediately evident and its coherence only demonstrable after considerable study. An equally important step also requires accomplishment – to deduce and evaluate the social and moral implications of the writer’s attitude towards the world created – and the real world around us. The New Criticism or Formalist approach which relied on linguistic analysis offers an excellent critical tool for examining the literariness of a work of art, but is not sufficient for a broader understanding of literature. 3 | Abiola Irele, ‘The Function of the African Critic’, an unpublished essay read at a conference of the Association of African Literary Critics. University of Ife. December 1975. Pp. 1 &7. A serious critic looks beyond the literariness or aesthetics of the work in order to deduce the author’s general outlook and attitude towards human experience – the depth and validity of his or her vision. Ultimately, the critic must come to terms with the truthfulness of that vision, its implicit as well as explicit values and the inherent implications of both vision and values when carried over into real life. After all, the criticism of literature is not a direct criticism of life, although a criticism of life is implied in it. The representation or image of life experience which we call literature is somewhat different from our actual experience of life. In coming to terms with an author’s vision the critic must be objective, and here I speak of the disinterested, academic critic whose preoccupation is with literature itself and not with its effects on life. It may be true that a developing nation cannot afford such intellectual detachment, and in that case the study of literature as such is, at best, a secondary or indirect activity in practical nation building. The literary critic whose commitment to society outweighs a commitment to artistic integrity, might more profitably rethink his or her priorities and engage more effectively in achieving social justice through direct means. Mainstream authors, on the other hand, have both a personal view of reality and a desire for artistic excellence in expressing it. The business of critics is to analyze and evaluate what authors have written. That is not to say that critics should not have strong views of their own, but that they should be able and willing to appreciate the effective expression of contrary views before categorizing them as irrelevant or invalid. It goes without saying that the matrix of reality, its core and substance, varies widely with the diverse views and experience of individuals. But a serious critic must be willing to appreciate versions other than those held personally – a conscious decision has to be made between being a critic of literature and a critic of life – commitment to criticism rather than to a cause. Among literary critics there are various schools or sects. Each has a valid point to make and an effective method to be followed. Beyond the Formalists, mentioned earlier, none is universally applicable. Each lends itself to a particular kind of writing and leaves that critic who is dedicated to a cause with no choice but to dismiss other kinds of literature as bad art, or even non-art. Many of the schools were called into being in response to radical developments in literary taste. New criteria and methods were needed in order to deal with evolving forms, styles, and themes. Others came into being in response to social and historical pressures – the need to re-evaluate existing literature according to the intellectual and psychological requirements of the present. The best criticism selects and applies the method, or combination of methods, which is most appropriate to the works at hand. Since views of social or psychological reality differ widely at any point in time, no single critical method will suffice for all works of art. Social reality is never homogenous although there may be only one pertinent reality for a given individual. The realities which operate in one’s life vary according to social background, education, occupation, and intellectual commitment. More importantly, they vary according to individual temperament and world-view. In any given community there are those whose outlook is objective, hard-headed, practical. At the same time there are others whose outlook is subjective, introspective, idealistic, or even mystical. A given author may be preoccupied with a single view to the near exclusion of all the rest – phenomenology, for example, literary form, myth patterning, human psychology, morality, or socio-political determinism. So long as the work itself offers us thoughts beyond the domain of art in a form which exhibits the characteristics of art, the critic has a duty to evaluate it as objectively as possible. A Nigerian critic has recently complained that ritual and myth are socially irrelevant. 4 | Femi Osofisan, 'Ritual and the Revolutionary Ethos, an unpublished essay read at the first Annual African International Conference, University of Ibadan, July 1976, p 8. No one would deny that our economic/industrialized separation from nature is accelerating, but there is no reason to presume that myth and ritual function in contemporary writing as literal or actual agents affecting social reality. They are self-conscious and imaginative constructs which have traditionally been associated with the sublime in art. As structural patterns or images of alternative and inner experience, they remain as valid today as they ever were. It is not necessarily a cowardly retreat into an irrelevant past to celebrate values and ideological structures which are traditional in a given society, especially if they are being used to comment on, or measure conditions arising from newer developments in that society. The operation of myth and ritual is just as ‘real’ and ‘valid’ in contemporary Nigeria, as factories, economic exploitation, and corruption. They provide a needed touchstone within social reality for a large number of citizens.